An Agreement of the People was a series of manifestos, published between 1647 and 1649, for constitutional changes to the English state. Several versions of the Agreement were published, each adapted to address not only broad concerns but also specific issues during the fast changing revolutionary political environment of those years. The Agreements of the People have been most associated as the manifestos of the Levellers but were also published by the Agitators and the General Council of the New Model Army. 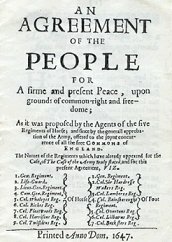 "An Agreement of the People for a firme and present Peace, upon grounds of common right and freedome ...", presented to the Army Council in October 1647. "An Agreement of the People of England, and the places therewith incorporated, for a secure and present peace, upon grounds of common right, freedom and safety", presented to the Rump Parliament in January 1649. "AN AGREEMENT OF THE Free People of England. Tendered as a Peace-Offering to this distressed Nation", extended version from the Leveller leaders, "Lieutenant Colonel John Lilburne, Master William Walwyn, Master Thomas Prince, and Master Richard Overton, Prisoners in the Tower of London, May the 1. 1649." Soon after the First English Civil War, the Agreement was the subject of the Putney Debates in 1647. The major tenets of this first version of the Agreement were: freedom of religion, the frequent convening of new parliaments and equality for all under the law. These tenets also appeared in the later versions of the manifesto. As these basic proposals were queried, other provisions were added; for example Roman Catholics were exempt from the right to religious freedom, and the electorate was to be made up of adult male property holders. The Levellers hoped to base England's new constitution on the Agreement of the People, but in the end, the New Model Army based their demands on an alternative less revolutionary document, the Heads of Proposals, that was proposed and supported by the Grandees (senior officers) of the Army. The Agreement is believed to have "greatly influence[ed] the development of the U.S. Constitution." ^ Prelude to Liberty. Archived June 4, 2012, at the Wayback Machine "Civics Library of the Missouri Bar". This page was last edited on 21 December 2018, at 23:08 (UTC).